Stunning studio, luxurious furniture, amazing views, peaceful environment. 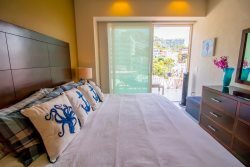 Vistalegre Rentals is pleased to offer this new luxury studio home away from home. Rincón de Almas has already become an emblematic building in the heart of Puerto Vallarta. Centered in the Old city centre, you will be within walking distance of dozens of bars and restaurants, and 3 blocks from the beach. The space is approximately 750 square meters, including a terrace that envelops the whole unit. Intelligent technology also controls this device. The whole unit was personalized with the collaboration of a great designer, Mikel Bowman. Everything from the floor to the worktops created this type of studio, together with custom-built furniture and artwork to create an atmosphere of enjoyment and functionality. The studio comes with smart home technology, so you can control lights, shadows and TV with your smartphone. Speaking of amenities, here are some of them: total blackout tones that are electronically controlled or your phone to facilitate. Rain shower of 22 liters per minute. Adjustable lights to create an atmosphere to your liking, along with the pre-set lighting moods. Virtuo Nespresso coffee maker to create a delicious coffee and espresso at the touch of a button. Television hidden with the screen on the ceiling. Finally, you are a few steps away from the oyster that is Vallarta. You will stay in luxury in the heart of Zona Romantica. Whether it's the beach, bars, or restaurants, you will stay in the center of it all. Taxis are the easiest way to get around Vallarta. In addition, most bus lines pass a few blocks from Rincón de Almas. The condo is located one block from the Rio Grande, and the island of which. The entire surrounding area is completely passable, and there are many adventures you can find on foot.